In late 2011, I wagered that Intel would follow-up its i7-3960X with an eight-core model within the year. That didn’t happen. Instead, we have had to wait nearly three years since that release to finally see an eight-core Intel desktop chip become a reality. Now for the big question: Was the company’s Core i7-5960X worth the wait? Futuremark’s no stranger to most enthusiasts, as its benchmarking software has been considered a de facto standard for about as long as it’s been fun to benchmark. While its 3DMark software is undoubtedly the company’s most popular offering, PCMark is a great tool for summing up the performance of a PC with gaming being a minor focus rather than a major one. 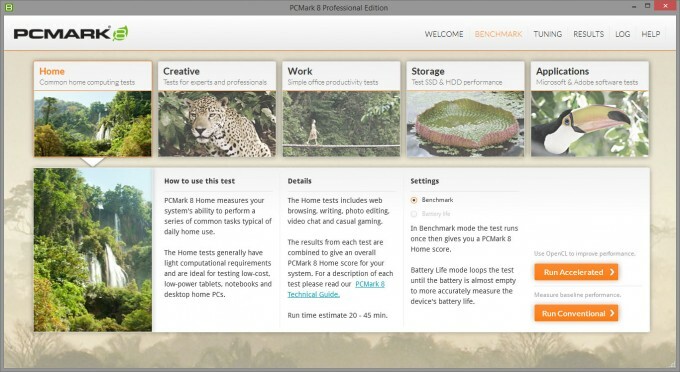 Futuremark’s latest PCMark, 8, consists of five main test suites: Home, Creative, Work, Storage, and Applications. The goal of each is to show how a system will perform overall in a given scenario, and their titles sum up each respective goal nicely. The Applications suite consists of two sub-suites; one for Adobe’s Creative Suite (or Creative Cloud), and the other for Microsoft Office. Of all these suites, we run them all except for the Storage, as it’s not that relevant. For fun, we also include the overall test results with PCMark 7 (just can’t bear to let it go!). Note: Our PCMark 8 installation for some reason couldn’t detect that After Effects was installed, so I didn’t run the application benchmarks in time for publishing. I admit that I expected stronger gains than this. It seems PCMark is far more frequency-dependent than core-dependent – at least when we’re dealing with processors with 6 or more cores.